Fitness routines that require little equipment, such as yoga and high-intensity interval training, are predicted to be more popular in 2018. Enough already with the activity trackers and fitness apps. They're so 2017. If you're tired of tech and of exercising solo and are ready to simplify your routine — maybe even join a group exercise class — you'll be in good company this new year. The latest annual survey of fitness professionals suggests 2018 will find more of us ditching the gadgets and getting back to basics in the way we work out: more resistance training, yoga and jump-ropes; fewer earbuds and iWatches. In the recent survey, the American College of Sports Medicine checked in with more than 4,000 fitness professionals around the world and asked them to look beyond marketing and discern exercise trends from fads. Among the top findings: Many of us prefer quick fitness routines, perhaps because we're busier than ever. For the second year in a row, the survey's results show high-intensity interval training tops the list of fitness trends, according to Walter R. Thompson, a research physiologist at Georgia State University and president of the ACSM. Typically, the high-intensity routines are simple, Thompson explains, involving short bursts of high-intensity exercise, such as sprinting or jumping rope, followed by a short period of rest or recovery, and can take less than 30 minutes from start to finish. Best of all, "it works," says Dr. Robert Sallis, a family and sports medicine physician with Kaiser Permanente Medical Center, in Fontana, Calif. The quick, high-intensity routines are designed to stress the body in all the areas affected by exercise, from the heart to the muscle to the metabolic system, and "all are pushed to the limit," Sallis says. Equinox's rope class involves exercising with a jump rope. The body's response to that is to function more efficiently, he says, so it allows us to get into shape quicker than moderate-intensity exercise. Sallis points to studies showing that just five to 10 minutes of high-intensity exercise can deliver the same results as 45 minutes of moderate exercise can. If you're not an athletic 25-year-old, you can still benefit from increasing the intensity of your workout, Sallis says. Just check with your doctor first, and get guidance on how to adapt the routine to your own physical status and limits. "As we get older, our muscles are not as elastic and pliable and we may not be able to tolerate these intense workouts," Sallis says, "so it's important to go into them gradually — maybe once a week and work up to perhaps three times a week." For example, he says, if you're accustomed to jogging at a moderate pace, you might try pushing it up and go as fast as you can for a block or two before returning to your normal pace. Do that every five minutes or so during your jog. The No. 2 fitness trend as we head into 2018 might surprise you: group exercise classes, with minimal equipment. Based on the new survey, Thompson says fewer people will be plugging in their earbuds and zoning out on fancy new pieces of electronic gym equipment. "Commercial clubs are moving away from the shiny new bells and whistles into more basic kinds of exercise programs." This means more simple things like body weight exercises, lunges, pushups and planks. If there is equipment, it is likely to be minimal, such as weights, body bars, kettle bells or jump-ropes, according to Amy Dixon, director of group fitness programming for Equinox Fitness Clubs, a global network of gyms. Dixon and colleagues have come up with a new high-intensity interval training class that centers on the old-fashioned jump-rope. "Obviously jump-roping has been around since our childhood," she says. "But we added style." And weight. Her classes include two jump-ropes — one lightweight agility rope and one weighted rope called "the fury." "That's the big boy," she says, "and you have to work a little bit harder. You change your grip on the handles to turn the rope and it improves your vertical leap. And, when you do that you're able to work harder and sustain high intensities." During her classes, participants alternate between jumping, cardio drills, and kicking and punching moves that are inspired by martial arts. The entire workout lasts just 30 minutes. The jump-rope classes also offer what individual exercise often does not — a connection to others, motivation and supervision from a pro. "In our clubs, those who work out in group classes are the most consistent," says Dixon. Thompson says research suggests this "connection" to others in working toward a common fitness goal can make a big difference in being able to stick with a routine — which may be why personal training is less popular this year and group training is up. "Wearable technology" as fitness aids — including activity trackers, smart watches, heart rate monitors and GPS tracking devices — certainly haven't gone away, Thompson says, they're just slipping in popularity, according to the survey. At first, Thompson says, "everyone wanted to talk about wearable tech because it accurately counted your steps and heart rate; but it turns out, that's all it did." One workout that holds steady in popularity, year after year, Thompson says, is different types of yoga. 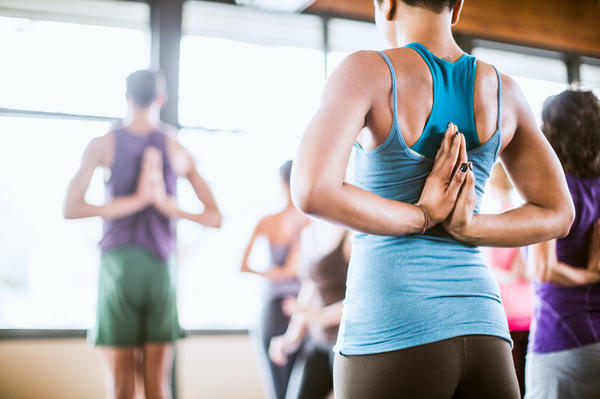 "Yoga instructors continue to reinvent themselves and create new forms of yoga so that the program doesn't become the boring same old exercise every time you walk into the gym," he says. It's New Year's Day. Have you started your resolutions yet? Maybe if you're like me, you've got some diet and exercise goals after over indulging this holiday. Well, NPR's Patti Neighmond reports on the most popular workout trends for 2018. PATTI NEIGHMOND, BYLINE: The biggest change for this coming year is a movement - back to the basics. Physiologist Walt Thompson says fewer people will be plugging in their ear buds and zoning out on fancy, new electronic equipment. WALT THOMPSON: Commercial clubs are moving away from the shiny new bells and whistles of yesteryear into more basic kinds of exercise programs. NEIGHMOND: Think group classes and more simple things like bodyweight exercises, lunges, pushups, planks. Thompson's is president of the American College of Sports Medicine, which every year surveys thousands of fitness instructors to see what's in and what's out when it comes to workouts. This year, group classes got the biggest boost jumping to No. 2 in fitness trends. THOMPSON: The gyms love it because the equipment is minimal. So it's very advantageous to gyms to have a lot of people in a single class because it helps the bottom line. NEIGHMOND: And class members like it because it offers what individual exercise often doesn't - connection to others, motivation and supervision from a pro. Amy Dixon directs group fitness programs at Equinox fitness clubs nationwide. AMY DIXON: They love the feeling that they get in a group. They love the fact that they can show up and have an instructor that's done their homework, that coaches them through an experience that allows them to get a workout in without them having to think about it. NEIGHMOND: Take for example the new Cut jump rope class, which Dixon helped develop. UNIDENTIFIED MAN: We're going to go in three, two, one. NEIGHMOND: The class warms up and starts to jump using different ropes - one regular, one weighted - and alternating every few minutes between cardio drills and martial arts punching and kicking. NEIGHMOND: After 30 minutes, the class is over, the first for 28-year-old Madison Williams (ph). WILLIAMS: You think you're in good shape until you have to, like, keep jumping for 30 minutes straight. NEIGHMOND: It's high-intensity interval training. And for the second year in a row, it's No. 1 on the American College of Sports Medicine's fitness list. And there's a good reason why high-intensity interval training stays on top. It works says, Dr. Robert Sallis, a sports medicine physician with Kaiser Permanente Medical Center. NEIGHMOND: ...And get into shape fast. Sallis points to studies showing just five to 10 minutes of high intensity exercise can deliver the same results as 45 minutes of moderate exercise. And he says it's all relative. If you're older, a bit overweight, not terrific shape, you can still gain benefit by pushing yourself to your version of high intensity. SALLIS: You know, you don't have to go to a super high intensity in the beginning especially - you know, just a little above what is normal - you're moderate intensity - really can add benefit. NEIGHMOND: So for example, if you jog at a moderate pace, push it up and go as fast as you can for a block or two. If high intensity intervals and group classes are in this year, what's out? Thompson says wearable technology and smartphone exercise apps won't be as popular, neither will things like Zumba, Pilates and cardio bar. One workout that hold steady year after year, he says, is yoga. SALLIS: The yoga instructors are continually reinventing themselves so that the program doesn't become boring. It doesn't become the same exercise program every single time you walk into the gym. NEIGHMOND: There's hot yoga, power yoga, restorative yoga and finally, rounding out the top 10, workouts for older adults. As the nation ages, Thompson says this trend will only get more and more popular. Patti Neighmond, NPR News. Transcript provided by NPR, Copyright NPR.